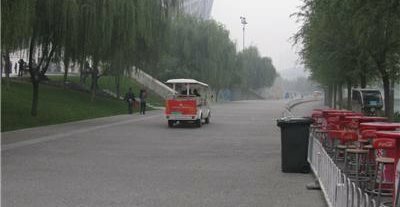 In Beijing, China, pervious concrete pavements combine beauty with practicality By Brian Farnsworth, Bomanite Corp.
At Beijing National Stadium, there are miles and miles of pervious concrete pavements, from parking lots to sidewalks. 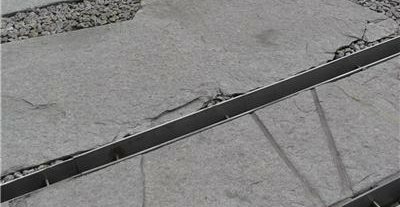 This section has strips of what look to be tempered glass inlayed in the slab. These inlays are parking dividers that light up at night. These stones were laid over a drainage grid and then mortared into place using pervious concrete. I'm not sure where the water drains, but it may be collected and recycled for use to water the surrounding landscape. The joints show no signs of degradation. Another look at the stones mortared in place by pervious concrete. 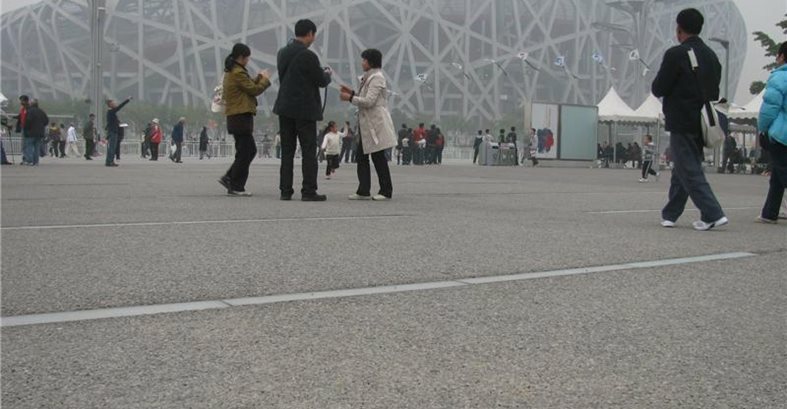 This pervious concrete street runs right in front of Beijing National Stadium. 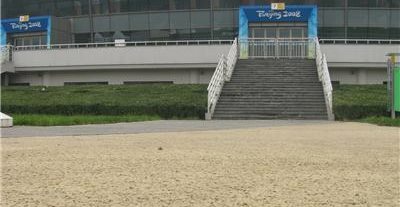 Beautiful, integrally colored pervious concrete, with the site of the badminton tournament for the 2008 Beijing Olympics in the background. According to project manager Wei Guan of Bomanite China, the biggest challenge they faced during these installations was maintaining color consistency. They had to be very consistent with the water demand from batch to batch. A cross-section view of the colored pervious concrete poured for the 2008 Beijing Olympics. A 4-inch base layer was placed and consolidated, and then a 2-inch layer of decorative pervious concrete with 3/8-inch aggregate was placed on top. All the colored pervious concrete was mixed onsite in electric mixers that could hold only about a yard of concrete, so it's amazing to see the consistency and durability evident on the project. 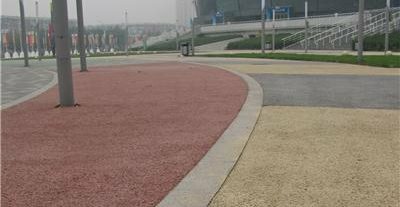 Vibrant pervious concrete in front of the badminton stadium. This is decorative pervious concrete at its best. 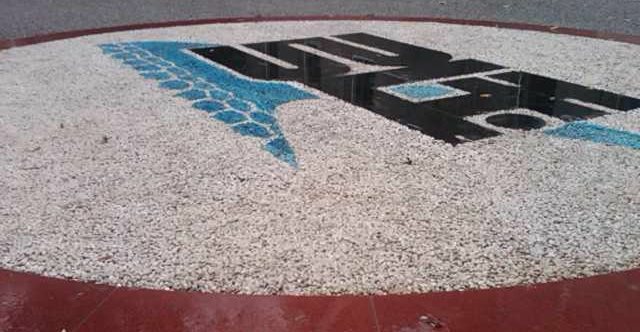 White aggregates and white cement were used to surround this logo, and then a very light retarder exposed the top of the aggregate. 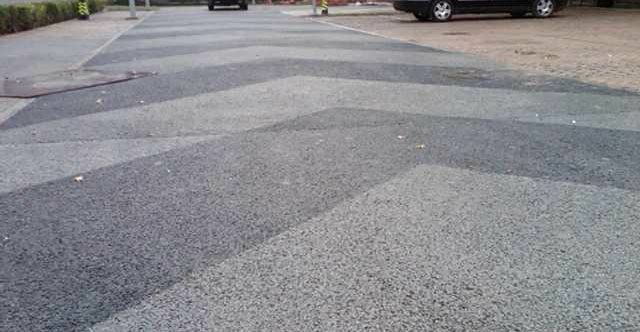 Pervious concrete next to detectable warning tiles. This plain-gray pervious concrete was treated with a colored lithium silicate, a simple way to add color to a pervious concrete job. In my mind, pervious concrete has always been utilitarian ­– typically gray, very rough, and with nothing decorative about it. I have also had doubts about the long-term durability of pervious concrete in freezing temperatures. On a recent trip to Beijing, China, I was introduced to the complete opposite. I encountered miles and miles of beautiful, colored pervious concrete pavements worthy of being called "decorative." 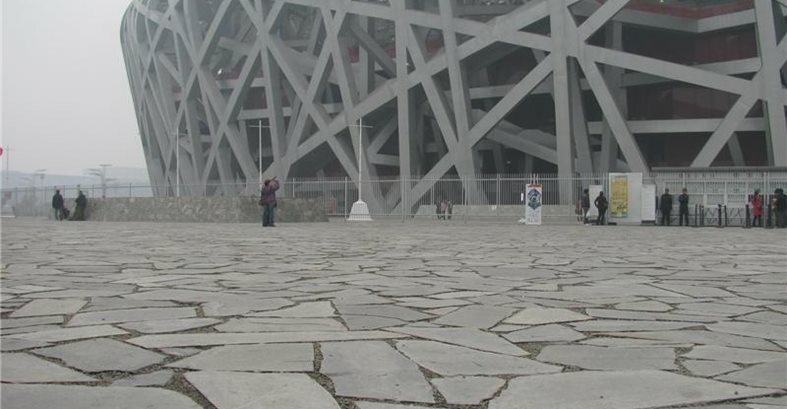 The decorative pervious concrete, built for the 2008 Summer Olympics at Beijing National Stadium, had been in place for almost four years. As I walked these pavements, I searched for signs of surface raveling or excessive cracking, and found none. 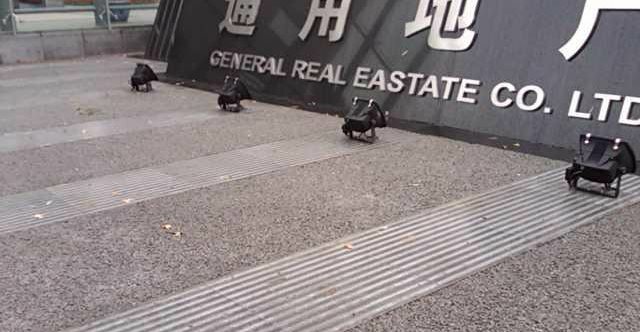 Beijing faces freezing temperatures in the winter; so I was encouraged to see this pervious concrete holding up so well. 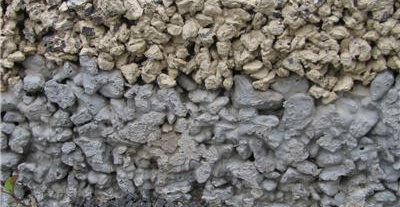 ACI Committee 522 defines pervious concrete as "a zero-slump, open-graded material consisting of portland cement, coarse aggregate, little or no fine aggregate, admixtures and water. The combination of these ingredients will produce a hardened material with connected pores, ranging in size from 0.08 to 0.32 inch, that allow water to pass through easily." What this definition does not mention is all the benefits to installing pervious concrete. In addition to allowing water to flow through the slab at an amazing rate (anywhere from 2 to 18 gallons per minute per square foot, according to ACI), pervious concrete reduces the area needed to manage stormwater runoff. Aquifers are replenished when rainwater percolates through the pavement and back into the earth. As water drains through pervious pavement, oil and other contaminates do not reach our water supplies and are filtered naturally in the soil. A pervious concrete slab will also cool down faster in the evening after the sun has gone down, helping to reduce the urban heat-island effect. These are great benefits to pervious concrete. But as these photos taken in Beijing show, pervious concrete can also add beauty and color to our world.